Data Federal Corporation is a consulting and professional services firm, with deep experience in software development, systems integration, advisory and assistance services, and program and acquisition support. 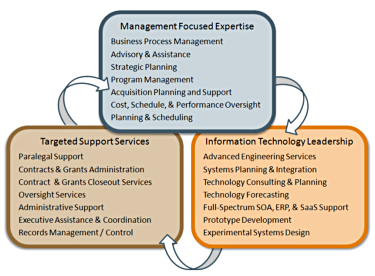 Leveraging our strong background in management, consulting services, engineering, and systems integration, Data Federal takes a holistic approach to any project, program, or consulting engagement. For many of our clients we serve as a trusted advisor, called upon to assist them with their most challenging requirements. Our seasoned management team has extensive commercial and government experience, having successfully operated in senior positions within both sectors. Additionally, meets the requirements for many of its employees to operate within the Intel and DoD business environment. At Data Federal, we believe that a commitment to quality and superior performance is essential to achieving success for our customers. Our solutions are designed to improve business processes, information technology infrastructures and systems, and end user services. We deliver solutions that increase responsiveness, while focusing on total cost control and reduction. By leveraging our industry experience, while ensuring that we focus on the customer, their needs, and their mission, Data Federal is successfully delivering to a diverse array of Federal and commercial customers.